This article is about an Islamic political ideology and political movement. For the religion itself, see Islam. Islamism is a concept whose meaning has been debated in both public and academic contexts. The term can refer to diverse forms of social and political activism advocating that public and political life should be guided by Islamic principles or more specifically to movements which call for full implementation of sharia. It is commonly used interchangeably with the terms political Islam or Islamic fundamentalism. In academic usage, the term Islamism does not specify what vision of "Islamic order" or sharia are being advocated, or how their advocates intend to bring them about. In Western mass media it tends to refer to groups whose aim is to establish a sharia-based Islamic state, often with implication of violent tactics and human rights violations, and has acquired connotations of political extremism. In the Muslim world, the term has positive connotations among its proponents. Different currents of Islamist thought include advocating a "revolutionary" strategy of Islamizing society through exercise of state power, and alternately a "reformist" strategy to re-Islamizing society through grass-roots social and political activism. Islamists may emphasize the implementation of sharia (Islamic law); pan-Islamic political unity, including an Islamic state; or selective removal of non-Muslim, particularly Western military, economic, political, social, or cultural influences in the Muslim world that they believe to be incompatible with Islam. Graham Fuller has argued for a broader notion of Islamism as a form of identity politics, involving "support for [Muslim] identity, authenticity, broader regionalism, revivalism, [and] revitalization of the community." Some authors hold the term "Islamic activism" to be synonymous and preferable to "Islamism", and Rached Ghannouchi writes that Islamists prefer to use the term "Islamic movement" themselves. Central and prominent figures in twentieth-century Islamism include Hasan al-Banna, Sayyid Qutb, Abul Ala Maududi, and Ruhollah Khomeini. Most Islamist thinkers emphasize peaceful political processes, which are supported by the majority of contemporary Islamists. Others, Sayyid Qutb in particular, called for violence, and his followers are generally considered Islamic extremists, although Qutb denounced the killing of innocents. According to Robin Wright, Islamist movements have "arguably altered the Middle East more than any trend since the modern states gained independence", redefining "politics and even borders". Following the Arab Spring, some Islamist currents became heavily involved in democratic politics, while others spawned "the most aggressive and ambitious Islamist militia" to date, ISIS. The term Islamism, which originally denoted the religion of Islam, first appeared in the English language as Islamismus in 1696, and as Islamism in 1712. The term appears in the U.S. Supreme Court decision in In Re Ross (1891). By the turn of the twentieth century the shorter and purely Arabic term "Islam" had begun to displaced it, and by 1938, when Orientalist scholars completed The Encyclopaedia of Islam, Islamism seems to have virtually disappeared from English usage. The term "Islamism" acquired its contemporary connotations in French academia in the late 1970s and early 1980s. From French, it began to migrate to the English language in the mid-1980s, and in recent years has largely displaced the term Islamic fundamentalism in academic circles. The new use of the term "Islamism" at first functioned as "a marker for scholars more likely to sympathize" with new Islamic movements; however, as the term gained popularity it became more specifically associated with political groups such as the Taliban or the Algerian Armed Islamic Group, as well as with highly-publicized acts of violence. "Islamists" who have spoken out against the use of the term, insisting they are merely "Muslims", include Ayatollah Mohammad Hussein Fadlallah (1935-2010), the spiritual mentor of Hizbullah, and Abbassi Madani (1931- ), leader of the Algerian Islamic Salvation Front. In summation, the term Islamism enjoyed its first run, lasting from Voltaire to the First World War, as a synonym for Islam. Enlightened scholars and writers generally preferred it to Mohammedanism. Eventually both terms yielded to Islam, the Arabic name of the faith, and a word free of either pejorative or comparative associations. There was no need for any other term, until the rise of an ideological and political interpretation of Islam challenged scholars and commentators to come up with an alternative, to distinguish Islam as modern ideology from Islam as a faith... To all intents and purposes, Islamic fundamentalism and Islamism have become synonyms in contemporary American usage. The Council on American–Islamic Relations complained in 2013 that the Associated Press's definition of "Islamist"—a "supporter of government in accord with the laws of Islam [and] who view the Quran as a political model"—had become a pejorative shorthand for "Muslims we don't like". Mansoor Moaddel, a sociologist at Eastern Michigan University, criticized it as "not a good term" because "the use of the term Islamist does not capture the phenomena that is quite heterogeneous." "An advocate or supporter of a political movement that favors reordering government and society in accordance with laws prescribed by Islam. Do not use as a synonym for Islamic fighters, militants, extremists or radicals, who may or may not be Islamists. Where possible, be specific and use the name of militant affiliations: al-Qaida-linked, Hezbollah, Taliban, etc. Those who view the Quran as a political model encompass a wide range of Muslims, from mainstream politicians to militants known as jihadi." "a theocratic ideology that seeks to impose any version of Islam over society by law". (Maajid Nawaz, a former Islamist turned critic). Subsequently, clarified to be "the desire to impose any given interpretation of Islam on society". a term "used by outsiders to denote a strand of activity which they think justifies their misconception of Islam as something rigid and immobile, a mere tribal affiliation." a movement so broad and flexible it reaches out to "everything to everyone" in Islam, making it "unsustainable". ... and at the extremes, a violent vehicle for rejectionists and radicals. "the organised political trend [...] that seeks to solve modern political problems by reference to Muslim texts [...] the whole body of thought which seeks to invest society with Islam which may be integrationist, but may also be traditionalist, reform-minded or even revolutionary"
"the active assertion and promotion of beliefs, prescriptions, laws or policies that are held to be Islamic in character,"
a movement of "Muslims who draw upon the belief, symbols, and language of Islam to inspire, shape, and animate political activity;" which may contain moderate, tolerant, peaceful activists or those who "preach intolerance and espouse violence." Islamism takes different forms and spans a wide range of strategies and tactics towards the powers in place—"destruction, opposition, collaboration, indifference" that have varied as "circumstances have changed"—and thus is not a united movement. Moderate and reformist Islamists who accept and work within the democratic process include parties like the Tunisian Ennahda Movement. Jamaat-e-Islami of Pakistan is basically a socio-political and democratic Vanguard party but has also gained political influence through military coup d'états in the past. Other Islamist groups like Hezbollah in Lebanon and Hamas in Palestine participate in the democratic and political process as well as armed attacks. Jihadist organizations like al-Qaeda and the Egyptian Islamic Jihad, and groups such as the Taliban, entirely reject democracy, often declaring as kuffar those Muslims who support it (see takfirism), as well as calling for violent/offensive jihad or urging and conducting attacks on a religious basis. Another major division within Islamism is between what Graham E. Fuller has described as the fundamentalist "guardians of the tradition" (Salafis, such as those in the Wahhabi movement) and the "vanguard of change and Islamic reform" centered around the Muslim Brotherhood. Olivier Roy argues that "Sunni pan-Islamism underwent a remarkable shift in the second half of the 20th century" when the Muslim Brotherhood movement and its focus on Islamisation of pan-Arabism was eclipsed by the Salafi movement with its emphasis on "sharia rather than the building of Islamic institutions," and rejection of Shia Islam. Following the Arab Spring, Roy has described Islamism as "increasingly interdependent" with democracy in much of the Arab Muslim world, such that "neither can now survive without the other." While Islamist political culture itself may not be democratic, Islamists need democratic elections to maintain their legitimacy. At the same time, their popularity is such that no government can call itself democratic that excludes mainstream Islamist groups. The relationship between the notions of Islam and Islamism has been subject to disagreement. Hayri Abaza argues that the failure to distinguish between Islam and Islamism leads many in the West to support illiberal Islamic regimes, to the detriment of progressive moderates who seek to separate religion from politics. In contrast, Abid Ullah Jan, writes "If Islam is a way of life, how can we say that those who want to live by its principles in legal, social, political, economic, and political spheres of life are not Muslims, but Islamists and believe in Islamism, not [just] Islam." A writer for the International Crisis Group maintains that "the conception of 'political Islam'" is a creation of Americans to explain the Iranian Islamic Revolution and apolitical Islam was a historical fluke of the "short-lived era of the heyday of secular Arab nationalism between 1945 and 1970", and it is quietist/non-political Islam, not Islamism, that requires explanation. Another source distinguishes Islamist from Islamic "by the fact that the latter refers to a religion and culture in existence over a millennium, whereas the first is a political/religious phenomenon linked to the great events of the 20th century". Islamists have, at least at times, defined themselves as "Islamiyyoun/Islamists" to differentiate themselves from "Muslimun/Muslims". Daniel Pipes describes Islamism as a modern ideology that owes more to European utopian political ideologies and "isms" than to the traditional Islamic religion. Few observers contest the influence of Islamism within the Muslim world. Following the collapse of the Soviet Union, political movements based on the liberal ideology of free expression and democratic rule have led the opposition in other parts of the world such as Latin America, Eastern Europe and many parts of Asia; however "the simple fact is that political Islam currently reigns as the most powerful ideological force across the Muslim world today". People see the unchanging socioeconomic condition in the Muslim world as a major factor. Olivier Roy believes "the socioeconomic realities that sustained the Islamist wave are still here and are not going to change: poverty, uprootedness, crises in values and identities, the decay of the educational systems, the North-South opposition, and the problem of immigrant integration into the host societies". The strength of Islamism also draws from the strength of religiosity in general in the Muslim world. Compared to Western societies, "[w]hat is striking about the Islamic world is that ... it seems to have been the least penetrated by irreligion". Where other peoples may look to the physical or social sciences for answers in areas which their ancestors regarded as best left to scripture, in the Muslim world, religion has become more encompassing, not less, as "in the last few decades, it has been the fundamentalists who have increasingly represented the cutting edge" of Muslim culture. Even before the Arab Spring, Islamists in Egypt and other Muslim countries had been described as "extremely influential. ... They determine how one dresses, what one eats. In these areas, they are incredibly successful. ... Even if the Islamists never come to power, they have transformed their countries." Democratic, peaceful and political Islamists are now dominating the spectrum of Islamist ideology as well as the political system of the Muslim world. Moderate strains of Islamism have been described as "competing in the democratic public square in places like Turkey, Tunisia, Malaysia and Indonesia". Moderate Islamism is a term denoting the emerging Islamist discourses and movements which considered deviated from the traditional Islamist discourses of the mid-20th century. Moderate Islamism is characterized by pragmatic participation within the existing constitutional and political framework, in the most cases democratic institution. Moderate Islamists make up the majority of the contemporary Islamist movements. From the philosophical perspective, their discourses are represented by reformation or reinterpretation of modern socio-political institutions and values imported from the West including democracy. This had led to the conception of Islamic form of such institutions, and Islamic interpretations are often attempted within this conception. In the example of democracy, Islamic democracy as an Islamized form of the system has been intellectually developed. In Islamic democracy, the concept of shura, the tradition of consultation which considered as Sunnah of the prophet Muhammad, is invoked to Islamically reinterpret and legitimatize the institution of democracy. Performance, goal, strategy, and outcome of moderate Islamist movements vary considerably depending on the country and its socio-political and historical context. In terms of performance, most of the Islamist political parties are oppositions. However, there are few examples they govern or obtain the substantial amount of the popular votes. This includes National Congress of Sudan, National Iraqi Alliance of Iraq and Justice and Development Party (PJD) of Morocco. Their goal also ranges widely. The Ennahda Movement of Tunisia and Prosperous Justice Party (PKS) of Indonesia formally resigned their vision of implementing sharia. In Morocco, PJD supported King Muhammad VI's Mudawana, a "startlingly progressive family law" which grants women the right to a divorce, raises the minimum age for marriage to 18, and, in the event of separation, stipulates equal distribution of property. To the contrary, National Congress of Sudan has implemented the strict interpretation of sharia with the foreign support from the conservative states. Movements of the former category are also termed as Post-Islamism (see below). Their political outcome is interdependent with their goal and strategy, in which what analysts call "inclusion-moderation theory" is in effect. Inclusion-moderation theory assumes that the more lenient the Islamists become, the less likely their survival will be threatened. Similarly, the more accommodating the government be, the less extreme Islamists become. Moderate Islamism within the democratic institution is a relatively recent phenomenon. Throughout the 80s and 90s, major moderate Islamist movements such as the Muslim Brotherhood and the Ennahda were excluded from democratic political participation. Islamist movements operated within the state framework were markedly scrutinized during the Algerian Civil War (1991-2002) and after the increase of terrorism in Egypt in the 90s. Reflecting on these failures, Islamists turned increasingly into revisionist and receptive to democratic procedures in the 21st century. The possibility of accommodating this new wave of modernist Islamism has been explored among the Western intellectuals, with the concept such as Turkish model was proposed. The concept was inspired by the perceived success of Turkish Justice and Development Party (AKP) led by Recep Tayyip Erdogan in harmonizing the Islamist principles within the secular state framework. Turkish model, however, has been considered came "unstuck" after recent purge and violations of democratic principles by the Erdogan regime. Critics of the concept hold that Islamist aspirations are fundamentally incompatible with the democratic principles, thus even moderate Islamists are totalitarian in nature. As such, it requires strong constitutional checks and the effort of the mainstream Islam to detach political Islam from the public discourses. Post-Islamism is a term proposed by Iranian political sociologist Asef Bayat, referring to the Islamist movements which marked by the critical departure from the traditional Islamist discourses of the mid-20th century. :4 Bayat explained it as "a condition where, following a phase of experimentation, the appeal, energy, symbols and sources of legitimacy of Islamism get exhausted, even among its once-ardent supporters. As such, post-Islamism is not anti-Islamic, but rather reflects a tendency to resecularize religion." It originally pertained only to Iran, where "post-Islamism is expressed in the idea of fusion between Islam (as a personalized faith) and individual freedom and choice; and post-Islamism is associated with the values of democracy and aspects of modernity". :45 A 2008 Lowy Institute for International Policy paper suggests that PKS of Indonesia and AKP of Turkey are post-Islamist. :51, 76 The characterization can be applied to Malaysian Islamic Party (PAS), and used to describe the "ideological evolution" within the Ennahda of Tunisia. The contemporary Salafi movement encompasses a broad range of ultraconservative Islamist doctrines which share the reformist mission of Ibn Taymiyyah. From the perspective of political Islam, the Salafi movement can be broadly categorized into three groups; the quietist (or the purist), the activist (or haraki) and the jihadist (Salafi jihadism, see below). The quietist school advocates for societal reform through religious education and proselytizing rather than political activism. The activist school, to the contrary, encourages political participation within the constitutional and political framework. The jihadist school is inspired by the ideology of Sayyid Qutb (Qutbism, see below), and rejects the legitimacy of secular institutions and promotes the revolution in order to pave the way for the establishment of a new Caliphate. The quietist Salafi movement is stemming from the teaching of Nasiruddin Albani, who challenged the notion of taqlid (imitation, conformity to the legal precedent) as a blind adherence. As such, they alarm the political participation as potentially leading to the division of the Muslim community. This school is exemplified by Madkhalism which based on the writings of Rabee al-Madkhali. Madkhalism was originated in the 90s Saudi Arabia, as a reaction against the rise of the Salafi activism and the threat of Salafi Jihadism. It rejects any kind of opposition against the secular governance, thus endorsed by the authoritarian governments of Egypt and Saudi Arabia during the 90s. The influence of the quietist school has waned significantly in the Middle East recently, as the governments began incorporating Islamist factions emanating from the popular demand. The politically active Salafi movement, Salafi activism or harakis, is based on the religious belief that endorses non-violent political activism in order to protect God's Divine governance. This means that politics is a field which requires Salafi principles to be applied as well, in the same manner with other aspects of society and life. Salafi activism was originated in the 50s to 60s Saudi Arabia, where many Muslim Brothers had taken refuge from the prosecution by the Nasser regime. There, Muslim Brothers' Islamism had synthesized with Salafism, and led to the creation of the Salafi activist trend exemplified by the Sahwa movement in the 80s, promulgated by Safar Al-Hawali and Salman al-Ouda. Today, the school makes up the majority of Salafism. There are many active Salafist political parties throughout the Muslim world, including Al Nour Party of Egypt, Al Islah of Yemen and Al Asalah of Bahrain. The antecedent of the contemporary Salafi movement is Wahhabism, which traces back to the 18th-century reform movement in Najd by Muhammad ibn Abd al-Wahhab. Although having different roots, Wahhabism and Salafism are considered more or less merged in the 60s Saudi Arabia. In the process, Salafism had been greatly influenced by Wahhabism, and today they share the similar religious outlook. Wahhabism is also described as a Saudi brand of Salafism. From the political perspective, Wahhabism is marked in its teaching of bay'ah (oath to allegiance), which requires Muslims to present an allegiance to the ruler of the society. Wahhabis have traditionally given their allegiance to the House of Saud, and this has made them apolitical in Saudi Arabia. However, there are small numbers of other strains including Salafi Jihadist offshoot which decline to present an allegiance to the House of Saud. Wahhabism is also characterized by its disinterest in social justice, anticolonialism, or economic equality, expounded upon by the mainstream Islamists. Historically, Wahhabism was state-sponsored and internationally propagated by Saudi Arabia with the help of funding from mainly Saudi petroleum exports, leading to the "explosive growth" of its influence (and subsequently, the influence of Salafism) from the 70s (a phenomenon often dubbed as Petro-Islam). Today, both Wahhabism and Salafism exert their influence worldwide, and they have been indirectly contributing to the upsurge of Salafi Jihadism as well. Qutbism is an ideology formulated by Sayyid Qutb, an influential figure of the Muslim Brotherhood during the 50s and 60s, which justifies the use of violence in order to push the Islamist goals. Qutbism is marked by the two distinct methodological concepts; one is takfirism, which in the context of Qutbism, indicates the excommunication of fellow Muslims who are deemed equivalent to apostate, and another is "offensive Jihad", a concept which promotes violence in the name of Islam against the perceived kuffar (infidels). Based on the two concepts, Qutbism promotes engagement against the state apparatus in order to topple down its regime. Fusion of Qutbism and Salafi Movement had resulted in the development of Salafi jihadism (see below). Qutbism is considered a product of the extreme repression experienced by Qutb and his fellow Muslim Brothers under the Nasser regime, which was resulted from the 1954 Muslim Brothers plot to assassinate Nasser. During the repression, thousands of Muslim Brothers were imprisoned, many of them, including Qutb, tortured and held in concentration camps. Under this condition, Qutb had cultivated his Islamist ideology in his seminal work Ma'alim fi-l-Tariq (Milestones), in which he equated the Muslims within the Nasser regime with secularism and the West, and described them as regression back to jahiliyyah (period of time before the advent of Islam). In this context, he allowed the tafkir (which was an unusual practice before the rejuvenation by Qutb) of said Muslims. Although Qutb was executed before the completion of his ideology, his idea was disseminated and continuously expanded by the later generations, among them Abdullah Yusuf Azzam and Ayman Al-Zawahiri, who was a student of Qutb's brother Muhammad Qutb and later became a mentor of Osama bin Laden. Al-Zawahiri was considered "the purity of Qutb's character and the torment he had endured in prison," and had played an extensive role in the normalization of offensive Jihad within the Qutbist discourse. Both al-Zawahiri and bin Laden had become the core of Jihadist movements which exponentially developed in the backdrop of the late 20th-century geopolitical crisis throughout the Muslim world. Salafi jihadism is a term coined by Gilles Kepel in 2002, referring to the ideology which actively promotes and conducts violence and terrorism in order to pursue the establishment of an Islamic state or a new Caliphate. Today, the term is often simplified to Jihadism or Jihadist movement in popular usage according to Martin Kramer. It is a hybrid ideology between Qutbism, Salafism, Wahhabism and other minor Islamist strains. Qutbism taught by scholars like Abdullah Azzam provided the political intellectual underpinnings with the concepts like takfirism, and Salafism and Wahhabism provided the religious intellectual input. [note 1] Salafi Jihadism makes up a tiny minority of the contemporary Islamist movements. Distinct characteristics of Salafi Jihadism noted by Robin Wright include the formal process of taking bay'ah (oath of allegiance) to the leader, which is inspired by the Wahhabi teaching. Another characteristic is its flexibility to cut ties with the less-popular movements when its strategically or financially convenient, exemplified by the relations between al-Qaeda and al-Nusra Front. Other marked developments of Salafi Jihadism include the concepts of "near enemy" and "far enemy". "Near enemy" connotes the despotic regime occupying the Muslim society, and the term was coined by Mohammed Abdul-Salam Farag in order to justify the assassination of Anwar al-Sadat by the Salafi Jihadi organization Egyptian Islamic Jihad (EIJ) in 1981. Later, the concept of "far enemy" which connotes the West was introduced and formally declared by al-Qaeda in 1996. Salafi Jihadism emerged out during the 80s when the Soviet invaded Afghanistan. Local mujahideen had extracted financial, logistical and military support from Saudi Arabia, Pakistan and the United States. Later, Osama bin Laden established al-Qaeda as a transnational Salafi Jihadi organization in 1988 to capitalize this financial, logistical and military network and to expand their operation. The ideology had seen its rise during the 90s when the Muslim world experienced numerous geopolitical crisis, notably the Algerian Civil War (1991–2002), Bosnian War (1992–1995), and the First Chechen War (1994–1996). Within these conflicts, political Islam often acted as a mobilizing factor for the local belligerents, who demanded financial, logistical and military support from al-Qaeda, in the exchange for active proliferation of the ideology. After the 1998 bombings of US embassies, September 11 attacks (2001), the US-led invasion of Afghanistan (2001) and Iraq (2003), Salafi Jihadism had seen its momentum. However, it got devastated by the US counterterrorism operations, culminated in bin Laden's death in 2011. 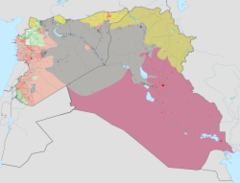 After the Arab Spring (2011) and subsequent Syrian Civil War (2011–present), the remnants of al-Qaeda franchise in Iraq had restored their capacity, which rapidly developed into the Islamic State of Iraq and the Levant, spreading its influence throughout the conflict zones of MENA region and the globe. Ibn Taymiyyah, a Syrian Islamic jurist during the 13th and 14th centuries who is often quoted by contemporary Islamists. Ibn Taymiyya argued against the shirking of Sharia law, was against practices such as the celebration of Muhammad's birthday, and "he believed that those who ask assistance from the grave of the Prophet or saints, are mushrikin (polytheists), someone who is engaged in shirk." Shah Waliullah of India and Muhammad ibn Abd-al-Wahhab of Arabia were contemporaries who met each other while studying in Mecca. Muhammad ibn Abd-al-Wahhab advocated doing away with the later accretions like grave worship and getting back to the letter and the spirit of Islam as preached and practiced by Muhammad. He went on to found Wahhabism. Shah Waliullah was a forerunner of reformist Islamists like Muhammad Abduh, Muhammad Iqbal and Muhammad Asad in his belief that there was "a constant need for new ijtihad as the Muslim community progressed and expanded and new generations had to cope with new problems" and his interest in the social and economic problems of the poor. Sayyid Ahmad Barelvi was a disciple and successor of Shah Waliullah's son who emphasized the 'purification' of Islam from un-Islamic beliefs and practices. He anticipated modern militant Islamists by leading an extremist, jihadist movement and attempted to create an Islamic state based on the enforcement of Islamic law. While he battled Sikh fundamentalist rule in Muslim-majority North-Western India, his followers fought against British colonialism after his death and allied themselves with the Indian Mutiny. After the failure of the Indian Mutiny, some of Shah Waliullah's followers turned to more peaceful methods for preserving India's Islamic heritage and founded the Dar al-Ulum seminary in 1867 in the town of Deoband. From the school developed the Deobandi movement which became the largest philosophical movement of traditional Islamic thought on the subcontinent and led to the establishment of thousands of madrasahs throughout modern-day India, Pakistan and Bangladesh. The end of the 19th century saw the dismemberment of most of the Muslim Ottoman Empire by non-Muslim European colonial powers. The empire spent massive sums on Western civilian and military technology to try to modernize and compete with the encroaching European powers, and in the process went deep into debt to these powers. In this context, the publications of Jamal ad-din al-Afghani (1837–97), Muhammad Abduh (1849–1905) and Rashid Rida (1865–1935) preached Islamic alternatives to the political, economic, and cultural decline of the empire. Muhammad Abduh and Rashid Rida formed the beginning of the Islamist movement, as well as the reformist Islamist movement. Their ideas included the creation of a truly Islamic society under sharia law, and the rejection of taqlid, the blind imitation of earlier authorities, which they believed deviated from the true messages of Islam. Unlike some later Islamists, Early Salafiyya strongly emphasized the restoration of the Caliphate. Muhammad Iqbal was a philosopher, poet and politician in British India who is widely regarded as having inspired the Islamic Nationalism and Pakistan Movement in British India. Iqbal is admired as a prominent classical poet by Pakistani, Iranian, Indian and other international scholars of literature. Though Iqbal is best known as an eminent poet, he is also a highly acclaimed "Islamic philosophical thinker of modern times". While studying law and philosophy in England and Germany, Iqbal became a member of the London branch of the All India Muslim League. He came back to Lahore in 1908. While dividing his time between law practice and philosophical poetry, Iqbal had remained active in the Muslim League. He did not support Indian involvement in World War I and remained in close touch with Muslim political leaders such as Muhammad Ali Johar and Muhammad Ali Jinnah. He was a critic of the mainstream Indian nationalist and secularist Indian National Congress. Iqbal's seven English lectures were published by Oxford University press in 1934 in a book titled The Reconstruction of Religious Thought in Islam. These lectures dwell on the role of Islam as a religion as well as a political and legal philosophy in the modern age. Iqbal expressed fears that not only would secularism and secular nationalism weaken the spiritual foundations of Islam and Muslim society, but that India's Hindu-majority population would crowd out Muslim heritage, culture and political influence. In his travels to Egypt, Afghanistan, Palestine and Syria, he promoted ideas of greater Islamic political co-operation and unity, calling for the shedding of nationalist differences. Sir Mummad Iqbal was elected president of the Muslim League in 1930 at its session in Allahabad as well as for the session in Lahore in 1932. In his Allahabad Address on 29 December 1930, Iqbal outlined a vision of an independent state for Muslim-majority provinces in northwestern India. This address later inspired the Pakistan movement. The thoughts and vision of Iqbal later influenced many reformist Islamists, e.g., Muhammad Asad, Sayyid Abul Ala Maududi and Ali Shariati. Sayyid Abul Ala Maududi was an important early twentieth-century figure in the Islamic revival in India, and then after independence from Britain, in Pakistan. Trained as a lawyer he chose the profession of journalism, and wrote about contemporary issues and most importantly about Islam and Islamic law. Maududi founded the Jamaat-e-Islami party in 1941 and remained its leader until 1972. However, Maududi had much more impact through his writing than through his political organising. His extremely influential books (translated into many languages) placed Islam in a modern context, and influenced not only conservative ulema but liberal modernizer Islamists such as al-Faruqi, whose "Islamization of Knowledge" carried forward some of Maududi's key principles. Maududi believed that Islam was all-encompassing: "Everything in the universe is 'Muslim' for it obeys God by submission to His laws... The man who denies God is called Kafir (concealer) because he conceals by his disbelief what is inherent in his nature and embalmed in his own soul." Maududi also believed that Muslim society could not be Islamic without Sharia, and Islam required the establishment of an Islamic state. This state should be a "theo-democracy," based on the principles of: tawhid (unity of God), risala (prophethood) and khilafa (caliphate). Although Maududi talked about Islamic revolution, by "revolution" he meant not the violence or populist policies of the Iranian Revolution, but the gradual changing the hearts and minds of individuals from the top of society downward through an educational process or da'wah. Roughly contemporaneous with Maududi was the founding of the Muslim Brotherhood in Ismailiyah, Egypt in 1928 by Hassan al Banna. His was arguably the first, largest and most influential modern Islamic political/religious organization. Under the motto "the Qur'an is our constitution," it sought Islamic revival through preaching and also by providing basic community services including schools, mosques, and workshops. Like Maududi, Al Banna believed in the necessity of government rule based on Shariah law implemented gradually and by persuasion, and of eliminating all imperialist influence in the Muslim world. Some elements of the Brotherhood, though perhaps against orders, did engage in violence against the government, and its founder Al-Banna was assassinated in 1949 in retaliation for the assassination of Egypt's premier Mahmud Fami Naqrashi three months earlier. The Brotherhood has suffered periodic repression in Egypt and has been banned several times, in 1948 and several years later following confrontations with Egyptian president Gamal Abdul Nasser, who jailed thousands of members for several years. Despite periodic repression, the Brotherhood has become one of the most influential movements in the Islamic world, particularly in the Arab world. For many years it was described as "semi-legal" and was the only opposition group in Egypt able to field candidates during elections. In the Egyptian parliamentary election, 2011–2012, the political parties identified as "Islamist" (the Brotherhood's Freedom and Justice Party, Salafi Al-Nour Party and liberal Islamist Al-Wasat Party) won 75% of the total seats. Mohamed Morsi, an Islamist of Muslim Brotherhood, was the first democratically elected president of Egypt. He was deposed during the 2013 Egyptian coup d'état. Maududi's political ideas influenced Sayyid Qutb a leading member of the Muslim Brotherhood movement, and one of the key philosophers of Islamism and highly influential thinkers of Islamic universalism. Qutb believed things had reached such a state that the Muslim community had literally ceased to exist. It "has been extinct for a few centuries," having reverted to Godless ignorance (Jahiliyya). To eliminate jahiliyya, Qutb argued Sharia, or Islamic law, must be established. Sharia law was not only accessible to humans and essential to the existence of Islam, but also all-encompassing, precluding "evil and corrupt" non-Islamic ideologies like communism, nationalism, or secular democracy. Qutb preached that Muslims must engage in a two-pronged attack of converting individuals through preaching Islam peacefully and also waging what he called militant jihad so as to forcibly eliminate the "power structures" of Jahiliyya—not only from the Islamic homeland but from the face of the earth. Qutb was both a member of the brotherhood and enormously influential in the Muslim world at large. Qutb is considered by some (Fawaz A. Gerges) to be "the founding father and leading theoretician" of modern jihadists, such as Osama bin Laden. However, the Muslim Brotherhood in Egypt and in Europe has not embraced his vision of undemocratic Islamic state and armed jihad, something for which they have been denounced by radical Islamists. The quick and decisive defeat of the Arab troops during the Six-Day War by Israeli troops constituted a pivotal event in the Arab Muslim world. The defeat along with economic stagnation in the defeated countries, was blamed on the secular Arab nationalism of the ruling regimes. A steep and steady decline in the popularity and credibility of secular, socialist and nationalist politics ensued. Ba'athism, Arab socialism, and Arab nationalism suffered, and different democratic and anti-democratic Islamist movements inspired by Maududi and Sayyid Qutb gained ground. The first modern "Islamist state" (with the possible exception of Zia's Pakistan) was established among the Shia of Iran. In a major shock to the rest of the world, Ayatollah Ruhollah Khomeini led the Iranian Revolution of 1979 in order to overthrow the oil-rich, well-armed, Westernized and pro-American secular monarchy ruled by Shah Muhammad Reza Pahlavi. The views of Ali Shariati, the ideologue of the Iranian Revolution, resembled those of Mohammad Iqbal, the ideological father of the State of Pakistan, but Khomeini's beliefs are perceived to be placed somewhere between the beliefs of Shia Islam and the beliefs of Sunni Islamic thinkers like Mawdudi and Qutb. He believed that complete imitation of the Prophet Mohammad and his successors such as Ali for the restoration of Sharia law was essential to Islam, that many secular, Westernizing Muslims were actually agents of the West and therefore serving Western interests, and that acts such as the "plundering" of Muslim lands was part of a long-term conspiracy against Islam by Western governments. As a Shia, Khomeini looked to Ali ibn Abī Tālib and Husayn ibn Ali Imam, but not Caliphs Abu Bakr, Omar or Uthman. 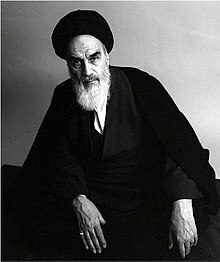 Khomeini talked not about restoring the Caliphate or Sunni Islamic democracy, but about establishing a state where the guardianship of the democratic or the dictatorial political system was performed by Shia jurists (ulama) as the successors of Shia Imams until the Mahdi returns from occultation. His concept of velayat-e-faqih ("guardianship of the [Islamic] jurist"), held that the leading Shia Muslim cleric in society—which Khomeini's mass of followers believed and chose to be himself—should serve as the supervisor of the state in order to protect or "guard" Islam and Sharia law from "innovation" and "anti-Islamic laws" passed by dictators or democratic parliaments. The revolution was influenced by Marxism through Islamist thought and also by writings that sought either to counter Marxism (Muhammad Baqir al-Sadr's work) or to integrate socialism and Islamism (Ali Shariati's work). A strong wing of the revolutionary leadership was made up of leftists or "radical populists", such as Ali Akbar Mohtashami-Pur. While initial enthusiasm for the Iranian revolution in the Muslim world was intense, it has waned as critics hold and campaign that "purges, executions, and atrocities tarnished its image". The Islamic Republic has also maintained its hold on power in Iran in spite of US economic sanctions, and has created or assisted like-minded Shia terrorist groups in Iraq, Egypt, Syria, Jordan (SCIRI) and Lebanon (Hezbollah) (two Muslim countries that also have large Shiite populations). During the 2006 Israel-Lebanon conflict, the Iranian government enjoyed something of a resurgence in popularity amongst the predominantly Sunni "Arab street," due to its support for Hezbollah and to President Mahmoud Ahmadinejad's vehement opposition to the United States and his call that Israel shall vanish. The strength of the Islamist movement was manifest in an event which might have seemed sure to turn Muslim public opinion against fundamentalism, but did just the opposite. In 1979 the Grand Mosque in Mecca Saudi Arabia was seized by an armed fundamentalist group and held for over a week. Scores were killed, including many pilgrim bystanders in a gross violation of one of the most holy sites in Islam (and one where arms and violence are strictly forbidden). Instead of prompting a backlash against the movement from which the attackers originated, however, Saudi Arabia, already very conservative, responded by shoring up its fundamentalist credentials with even more Islamic restrictions. Crackdowns followed on everything from shopkeepers who did not close for prayer and newspapers that published pictures of women, to the selling of dolls, teddy bears (images of animate objects are considered haraam), and dog food (dogs are considered unclean). despite the fact that the object of the fundamentalists' revolt was the Kingdom of Saudi Arabia, America's major ally in the region. Anti-American demonstrations followed in the Philippines, Turkey, Bangladesh, India, the UAE, Pakistan, and Kuwait. The US Embassy in Libya was burned by protesters chanting pro-Khomeini slogans and the embassy in Islamabad, Pakistan was burned to the ground. In 1979, the Soviet Union deployed its 40th Army into Afghanistan, attempting to suppress an Islamic rebellion against an allied Marxist regime in the Afghan Civil War. The conflict, pitting indigenous impoverished Muslims (mujahideen) against an anti-religious superpower, galvanized thousands of Muslims around the world to send aid and sometimes to go themselves to fight for their faith. Leading this pan-Islamic effort was Palestinian sheikh Abdullah Yusuf Azzam. While the military effectiveness of these "Afghan Arabs" was marginal, an estimated 16,000 to 35,000 Muslim volunteers came from around the world to fight in Afghanistan. When the Soviet Union abandoned the Marxist Najibullah regime and withdrew from Afghanistan in 1989 (the regime finally fell in 1992), the victory was seen by many Muslims as the triumph of Islamic faith over superior military power and technology that could be duplicated elsewhere. The "veterans of the guerrilla campaign" returning home to Algeria, Egypt, and other countries "with their experience, ideology, and weapons," were often eager to continue armed jihad. The collapse of the Soviet Union itself, in 1991, was seen by many Islamists, including Bin Laden, as the defeat of a superpower at the hands of Islam. Concerning the $6 billion in aid given by the US and Pakistan's military training and intelligence support to the mujahideen, bin Laden wrote: "[T]he US has no mentionable role" in "the collapse of the Soviet Union ... rather the credit goes to God and the mujahidin" of Afghanistan. Another factor in the early 1990s that worked to radicalize the Islamist movement was the Gulf War, which brought several hundred thousand US and allied non-Muslim military personnel to Saudi Arabian soil to put an end to Saddam Hussein's occupation of Kuwait. Prior to 1990 Saudi Arabia played an important role in restraining the many Islamist groups that received its aid. But when Saddam, secularist and Ba'athist dictator of neighboring Iraq, attacked Saudi Arabia (his enemy in the war), western troops came to protect the Saudi monarchy. Islamists accused the Saudi regime of being a puppet of the west. These attacks resonated with conservative Muslims and the problem did not go away with Saddam's defeat either, since American troops remained stationed in the kingdom, and a de facto cooperation with the Palestinian-Israeli peace process developed. Saudi Arabia attempted to compensate for its loss of prestige among these groups by repressing those domestic Islamists who attacked it (bin Laden being a prime example), and increasing aid to Islamic groups (Islamist madrassas around the world and even aiding some violent Islamist groups) that did not, but its pre-war influence on behalf of moderation was greatly reduced. One result of this was a campaign of attacks on government officials and tourists in Egypt, a bloody civil war in Algeria and Osama bin Laden's terror attacks climaxing in the 9/11 attack. In Afghanistan, the mujahideen's victory against the Soviet Union in the 1980s did not lead to justice and prosperity, due to a vicious and destructive civil war between political and tribal warlords, making Afghanistan one of the poorest countries on earth. In 1992, the Democratic Republic of Afghanistan ruled by communist forces collapsed, and democratic Islamist elements of mujahdeen founded the Islamic State of Afghanistan. In 1996, a more conservative and anti-democratic Islamist movement known as the Taliban rose to power, defeated most of the warlords and took over roughly 80% of Afghanistan. The Taliban were spawned by the thousands of madrasahs the Deobandi movement established for impoverished Afghan refugees and supported by governmental and religious groups in neighboring Pakistan. The Taliban differed from other Islamist movements to the point where they might be more properly described as Islamic fundamentalist or neofundamentalist, interested in spreading "an idealized and systematized version of conservative tribal village customs" under the label of Sharia to an entire country. Their ideology was also described as being influenced by Wahhabism, and the extremist jihadism of their guest Osama bin Laden. The Taliban's hosting of Osama bin Laden led to an American-organized attack which drove them from power following the 9/11 attacks. Taliban are still very much alive and fighting a vigorous insurgency with suicide bombings and armed attacks being launched against NATO and Afghan government targets. An Islamist movement influenced by Salafism and the jihad in Afghanistan, as well as the Muslim Brotherhood, was the FIS or Front Islamique de Salut (the Islamic Salvation Front) in Algeria. Founded as a broad Islamist coalition in 1989 it was led by Abbassi Madani, and a charismatic Islamist young preacher, Ali Belhadj. Taking advantage of economic failure and unpopular social liberalization and secularization by the ruling leftist-nationalist FLN government, it used its preaching to advocate the establishment of a legal system following Sharia law, economic liberalization and development program, education in Arabic rather than French, and gender segregation, with women staying home to alleviate the high rate of unemployment among young Algerian men. The FIS won sweeping victories in local elections and it was going to win national elections in 1991 when voting was canceled by a military coup d'état. As Islamists took up arms to overthrow the government, the FIS's leaders were arrested and it became overshadowed by Islamist guerrilla groups, particularly the Islamic Salvation Army, MIA and Armed Islamic Group (or GIA). A bloody and devastating civil war ensued in which between 150,000 and 200,000 people were killed over the next decade. The civil war was not a victory for Islamists. By 2002 the main guerrilla groups had either been destroyed or had surrendered. The popularity of Islamist parties has declined to the point that "the Islamist candidate, Abdallah Jaballah, came a distant third with 5% of the vote" in the 2004 presidential election. Jamaat-e-Islami Bangladesh is the largest Islamist party in the country and supports the implementation of Sharia law and promotes the country's main right-wing politics. Since 2000, the main political opposition Bangladesh Nationalist Party (BNP) has been allied with it and another Islamic party, Islami Oikya Jote. Some of their leaders and supporters, including former ministers and MPs, have been hanged for alleged war crimes during Bangladesh's struggle for independence and speaking against the ruling Bangladesh Awami League. In the 2012, the party named Islam had four candidates and they were elected in Molenbeek and Anderlecht. In 2018, they candidated in 28 municipalities. Its policies include schools must offer halal food and women must be able to wear a headscarf anywhere. 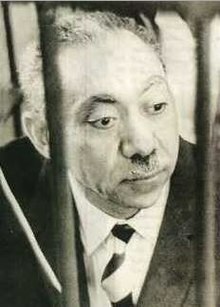 While Qutb's ideas became increasingly radical during his imprisonment prior to his execution in 1966, the leadership of the Brotherhood, led by Hasan al-Hudaybi, remained moderate and interested in political negotiation and activism. Fringe or splinter movements inspired by the final writings of Qutb in the mid-1960s (particularly the manifesto Milestones, a.k.a. Ma'alim fi-l-Tariq) did, however, develop and they pursued a more radical direction. By the 1970s, the Brotherhood had renounced violence as a means of achieving its goals. Another of the Egyptian groups which employed violence in their struggle for Islamic order was al-Gama'a al-Islamiyya (Islamic Group). Victims of their campaign against the Egyptian state in the 1990s included the head of the counter-terrorism police (Major General Raouf Khayrat), a parliamentary speaker (Rifaat al-Mahgoub), dozens of European tourists and Egyptian bystanders, and over 100 Egyptian police. Ultimately the campaign to overthrow the government was unsuccessful, and the major jihadi group, Jamaa Islamiya (or al-Gama'a al-Islamiyya), renounced violence in 2003. Other lesser known groups include the Islamic Liberation Party, Salvation from Hell and Takfir wal-Hijra, and these groups have variously been involved in activities such as attempted assassinations of political figures, arson of video shops and attempted takeovers of government buildings. Hamas is a Palestinian Sunni Islamist organization that governs the Gaza Strip where it has moved to establish sharia law in matters such as separation of the genders, using the lash for punishment, and Islamic dress code. Hamas also has a military resistance wing, the Izz ad-Din al-Qassam Brigades. For some decades prior to the First Palestine Intifada in 1987, the Muslim Brotherhood in Palestine took a "quiescent" stance towards Israel, focusing on preaching, education and social services, and benefiting from Israel's "indulgence" to build up a network of mosques and charitable organizations. As the First Intifada gathered momentum and Palestinian shopkeepers closed their shops in support of the uprising, the Brotherhood announced the formation of HAMAS ("zeal"), devoted to Jihad against Israel. Rather than being more moderate than the PLO, the 1988 Hamas charter took a more uncompromising stand, calling for the destruction of Israel and the establishment of an Islamic state in Palestine. It was soon competing with and then overtaking the PLO for control of the intifada. The Brotherhood's base of devout middle class found common cause with the impoverished youth of the intifada in their cultural conservatism and antipathy for activities of the secular middle class such as drinking alcohol and going about without hijab. Hamas has continued to be a major player in Palestine. From 2000 to 2007 it killed 542 people in 140 suicide bombing or "martyrdom operations". In the January 2006 legislative election—its first foray into the political process—it won the majority of the seats, and in 2007 it drove the PLO out of Gaza. Hamas has been praised by Muslims for driving Israel out of the Gaza Strip, but criticized for failure to achieve its demands in the 2008–09 and 2014 Gaza Wars despite heavy destruction and significant loss of life. Sovereignty belongs to Allah alone but He has delegated it to the State of Pakistan through its people for being exercised within the limits prescribed by Him as a sacred trust. The State shall exercise its powers and authority through the elected representatives of the people. The principles of democracy, freedom, equality, tolerance and social justice, as enunciated by Islam, shall be fully observed. Muslims shall be enabled to order their lives in the individual and collective spheres in accordance with the teachings of Islam as set out in the Quran and Sunnah. Provision shall be made for the religious minorities to freely profess and practice their religions and develop their cultures. This resolution later became a key source of inspiration for writers of the Constitution of Pakistan, and is included in the constitution as preamble. In July 1977, General Zia-ul-Haq overthrew Prime Minister Zulfiqar Ali Bhutto's regime in Pakistan. Ali Bhutto, a leftist in democratic competition with Islamists, had announced banning alcohol and nightclubs within six months, shortly before he was overthrown. Zia-ul-Haq was much more committed to Islamism, and "Islamization" or implementation of Islamic law, became a cornerstone of his eleven-year military dictatorship and Islamism became his "official state ideology". Zia ul Haq was an admirer of Mawdudi and Mawdudi's party Jamaat-e-Islami became the "regime's ideological and political arm". In Pakistan this Islamization from above was "probably" more complete "than under any other regime except those in Iran and Sudan," but Zia-ul-Haq was also criticized by many Islamists for imposing "symbols" rather than substance, and using Islamization to legitimize his means of seizing power. Unlike neighboring Iran, Zia-ul-Haq's policies were intended to "avoid revolutionary excess", and not to strain relations with his American and Persian Gulf state allies. Zia-ul-Haq was killed in 1988 but Islamization remains an important element in Pakistani society. For many years, Sudan had an Islamist regime under the leadership of Hassan al-Turabi. His National Islamic Front first gained influence when strongman General Gaafar al-Nimeiry invited members to serve in his government in 1979. Turabi built a powerful economic base with money from foreign Islamist banking systems, especially those linked with Saudi Arabia. He also recruited and built a cadre of influential loyalists by placing sympathetic students in the university and military academy while serving as minister of education. After al-Nimeiry was overthrown in 1985 the party did poorly in national elections, but in 1989 it was able to overthrow the elected post-al-Nimeiry government with the help of the military. Turabi was noted for proclaiming his support for the democratic process and a liberal government before coming to power, but strict application of sharia law, torture and mass imprisonment of the opposition, and an intensification of the long-running war in southern Sudan, once in power. The NIF regime also harbored Osama bin Laden for a time (before 9/11), and worked to unify Islamist opposition to the American attack on Iraq in the 1991 Gulf War. After Sudanese intelligence services were implicated in an assassination attempt on the President of Egypt, UN economic sanctions were imposed on Sudan, a poor country, and Turabi fell from favor. He was imprisoned for a time in 2004–05. Some of the NIF policies, such as the war with the non-Muslim south, have been reversed, though the National Islamic Front still holds considerable power in the government of Omar al-Bashir and National Congress Party, another Islamist party in country. Turkey had a number of Islamist parties, often changing names as they were banned by the constitutional court for anti-secular activities. Necmettin Erbakan (1926-2011) was the leader of several of the parties, the National Order Party (Milli Nizam Partisi, 1970–1971), the National Salvation Party (Milli Selamet Partisi, 1972–1981), and the Welfare Party (Refah Partisi, 1983-1998); he also became a member of the Felicity Party (Saadet Partisi, 2003–2011). The Justice and Development Party (AKP), which has dominated Turkish politics since 2002, is sometimes described as Islamist, but rejects such classification. Various Islamist political groups are dominant forces in the political systems of Afghanistan, Iran and Iraq. The Green Algeria Alliance is an Islamist coalition of political parties, created for the legislative election of 2012 in Algeria. It includes the Movement of Society for Peace (Hamas), Islamic Renaissance Movement (Ennahda) and the Movement for National Reform (Islah). The alliance is led by Bouguerra Soltani of Hamas. However, the incumbent coalition, comprising the FLN of President Abdelaziz Bouteflika and the RND of Prime Minister Ahmed Ouyahia, held on to power after winning a majority of seats, and the Islamist parties of the Green Algeria Alliance lost seats in the legislative election of 2012. Shia Islamist Al Wefaq, Salafi Islamist Al Asalah and Sunni Islamist Al-Menbar Islamic Society are dominant democratic forces in Bahrain. In Indonesia, Prosperous Justice Party is the major Islamist political party in the country's democratic process. Islamic Action Front is Jordan's Islamist political party and largest democratic political force in the country. The IAF's survival in Jordan is primarily due to its flexibility and less radical approach to politics. Hadas or "Islamic Constitutional Movement" is Kuwait's Sunni Islamist party. Islamic Group (Lebanon) is a Sunni Islamist political party in Lebanon. Hezbollah is a Shia Islamist political party in Lebanon. The Justice and Construction Party is the Muslim Brotherhood's political arm in Libya and the second largest political force in the country. The National Forces Alliance, the largest political group in country, doesn't believe the country should be run entirely by Sharia law or secular]] law, but does hold that Sharia should be "the main inspiration for legislation." Party leader Jibril has said the NFA is a moderate Islamic moveme that recognises the importance of Islam in political life and favours Sharia as the basis of the law. The Justice and Development Party (Morocco) is the ruling party in Morocco since 29 November 2011, advocating Islamism and Islamic democracy. The Muslim Brotherhood of Syria is a Sunni Islamist force in Syria and very loosely affiliated to the Egyptian Muslim Brotherhood. It has also been called the "dominant group" or "dominant force" in the Arab Spring uprising in Syria. The group's stated political positions are moderate and in its most recent April 2012 manifesto it "pledges to respect individual rights", to promote pluralism and democracy. The Islamic Renaissance Party of Tajikistan is Tajikistan's Islamist party and main opposition and democratic force in the country. The Ennahda Movement, also known as Renaissance Party or simply Ennahda, is a moderate Islamist political party in Tunisia. On 1 March 2011, after the government of Zine El Abidine Ben Ali collapsed in the wake of the 2011 Tunisian revolution, Tunisia's interim government granted the group permission to form a political party. Since then it has become the biggest and most well-organized party in Tunisia, so far outdistancing its more secular competitors. In the Tunisian Constituent Assembly election of 2011, the first honest election in the country's history with a turnout of 51% of all eligible voters, the party won 37% of the popular vote and 89 (41%) of the 217 assembly seats, far more than any other party. Eastern Africa has become a hotbed of violent Islamic extremism since the late 1990s, one of the relevant movements being al-Shabaab, active in Somalia and Kenya, which emerged in response to the 2006–09 Ethiopian intervention in Somalia. West Africa has seen the rise of influential Islamic extremist organizations, notably Boko Haram in Northern Nigeria and al-Qaeda in the Islamic Maghreb in Mali. Hizb ut-Tahrir is an influential international Islamist movement, founded in 1953 by an Islamic Qadi (judge) Taqiuddin al-Nabhani. HT is unique from most other Islamist movements in that the party focuses not on implementation of Sharia on local level or on providing social services, but on unifying the Muslim world under its vision of a new Islamic caliphate spanning from North Africa and the Middle East to much of central and South Asia. To this end it has drawn up and published a 186-article constitution for its proposed caliphate-state specifying specific policies such as sharia law, a "unitary ruling system" headed by a caliph elected by Muslims, an economy based on the gold standard, public ownership of utilities, public transport, and energy resources, death for apostates and Arabic as the "sole language of the State." In its focus on the Caliphate, the party takes a different view of Muslim history than some other Islamists such as Muhammad Qutb. HT sees Islam's pivotal turning point as occurring not with the death of Ali, or one of the other four rightly guided Caliphs in the 7th century, but with the abolition of the Ottoman Caliphate in 1924. This is believed to have ended the true Islamic system, something for which it blames "the disbelieving (Kafir) colonial powers" working through Turkish modernist Mustafa Kemal Atatürk. HT does not engage in armed jihad or work for a democratic system, but works to take power through "ideological struggle" to change Muslim public opinion, and in particular through elites who will "facilitate" a "change of the government," i.e., launch a "bloodless" coup. It allegedly attempted and failed such coups in 1968 and 1969 in Jordan, and in 1974 in Egypt, and is now banned in both countries. The party is sometimes described as "Leninist" and "rigidly controlled by its central leadership," with its estimated one million members required to spend "at least two years studying party literature under the guidance of mentors (Murshid)" before taking "the party oath." HT is particularly active in the ex-soviet republics of Central Asia and in Europe. In the UK its rallies have drawn thousands of Muslims, and the party has been described by two observers (Robert S. Leiken and Steven Brooke) to have outpaced the Muslim Brotherhood in both membership and radicalism. The repression of the Muslim Brotherhood. Primarily by the Egyptian military and courts following the forcible removal of Morsi from office in 2013; but also by Saudi Arabia and a number of Gulf countries (not Qatar). Rise of Islamist "state-building" where "state failure" has taken place—most prominently in Syria, Iraq, Libya and Yemen. Islamists have found it easier than competing non-Islamists trying to fill the void of state failure, by securing external funding, weaponry and fighters—"many of which have come from abroad and have rallied around a pan-Islamic identity". The norms of governance in these Islamist areas are militia-based, and the population submit to their authority out of fear, loyalty, other reasons, or some combination. The "most expansive" of these new "models" is the Islamic State. Increased caution and political learning in countries such as Algeria and Jordan where Islamist have chosen not to lead a major challenge against their governments. In Yemen Islah "has sought to frame its ideology in a way that will avoid charges of militancy". the failure to take power during the Arab Spring has led not to "soul-searching" in major Islamist groups about what went wrong, but instead to "antagonism and fiery anger" and a thirst for revenge. Partisans of political Islam (although this does not include some prominent leaders such as Rached Ghannouchi but is particularly true in Egypt) see themselves as victims of an injustice whose perpetrators are not just "individual conspirators but entire social groups". Originating as the Jama'at al-Tawhid wal-Jihad in 1999, ISIL pledged allegiance to al-Qaeda in 2004, participated in the Iraqi insurgency that followed the invasion of Iraq by Western coalition forces in 2003, joined the fight in the Syrian Civil War beginning in 2011, and was expelled from al-Qaeda in early 2014, (which complained of its failure to consult and "notorious intransigence"). ISIL gained prominence after it drove Iraqi government forces out of key cities in western Iraq in an offensive in June that same year. The group is adept at social media, posting Internet videos of beheadings of soldiers, civilians, journalists and aid workers, and is known for its destruction of cultural heritage sites. The United Nations (UN) has held ISIL responsible for human rights abuses and war crimes, and Amnesty International has reported ethnic cleansing by the group on a "historic scale". The group has been designated a terrorist organisation by the UN, the European Union (EU) and member states, the United States, India, Indonesia, Turkey, Saudi Arabia, Syria and other countries. Islamist movements such as the Muslim Brotherhood, "are well known for providing shelters, educational assistance, free or low cost medical clinics, housing assistance to students from out of town, student advisory groups, facilitation of inexpensive mass marriage ceremonies to avoid prohibitively costly dowry demands, legal assistance, sports facilities, and women's groups." All this compares very favourably against incompetent, inefficient, or neglectful governments whose commitment to social justice is limited to rhetoric. The Arab world—the original heart of the Muslim world—has been afflicted with economic stagnation. For example, it has been estimated that in the mid 1990s the exports of Finland, a country of five million, exceeded those of the entire Arab world of 260 million, excluding oil revenue. This economic stagnation is argued to have commenced with the demise of the Ottoman Caliphate in 1924, with trade networks being disrupted and societies torn apart with the creation of new nation states; prior to this, the Middle East had a diverse and growing economy and more general prosperity. Strong population growth combined with economic stagnation has created urban agglomerations in Cairo, Istanbul, Tehran, Karachi, Dhaka, and Jakarta each with well over 12 million citizens, millions of them young and unemployed or underemployed. Such a demographic, alienated from the westernized ways of the urban elite, but uprooted from the comforts and more passive traditions of the villages they came from, is understandably favourably disposed to an Islamic system promising a better world—an ideology providing an "emotionally familiar basis for group identity, solidarity, and exclusion; an acceptable basis for legitimacy and authority; an immediately intelligible formulation of principles for both a critique of the present and a program for the future." Islamism can also be described as part of identity politics, specifically the religiously-oriented nationalism that emerged in the Third World in the 1970s: "resurgent Hinduism in India, Religious Zionism in Israel, militant Buddhism in Sri Lanka, resurgent Sikh nationalism in the Punjab, 'Liberation Theology' of Catholicism in Latin America, and Islamism in the Muslim world." These all challenged Westernized ruling elites on behalf of 'authenticity' and tradition. The modern revival of Islamic devotion and the attraction to things Islamic can be traced to several events. By the end of World War I, most Muslim states were seen to be dominated by the Christian-leaning Western states. It is argued that either the claims of Islam were false and the Christian or post-Christian West had finally come up with another system that was superior, or Islam had failed through not being true to itself. Thus, a redoubling of faith and devotion by Muslims was called for to reverse this tide. The connection between the lack of an Islamic spirit and the lack of victory was underscored by the disastrous defeat of Arab nationalist-led armies fighting under the slogan "Land, Sea and Air" in the 1967 Six-Day War, compared to the (perceived) near-victory of the Yom Kippur War six years later. In that war the military's slogan was "God is Great". Along with the Yom Kippur War came the Arab oil embargo where the (Muslim) Persian Gulf oil-producing states' dramatic decision to cut back on production and quadruple the price of oil, made the terms oil, Arabs and Islam synonymous—with power—in the world, and especially in the Muslim world's public imagination. Many Muslims believe as Saudi Prince Saud al Faisal did that the hundreds of billions of dollars in wealth obtained from the Persian Gulf's huge oil deposits were nothing less than a gift from God to the Islamic faithful. As the Islamic revival gained momentum, governments such as Egypt's, which had previously repressed (and was still continuing to repress) Islamists, joined the bandwagon. They banned alcohol and flooded the airwaves with religious programming, giving the movement even more exposure. Starting in the mid-1970s the Islamic resurgence was funded by an abundance of money from Saudi Arabian oil exports. The tens of billions of dollars in "petro-Islam" largesse obtained from the recently heightened price of oil funded an estimated "90% of the expenses of the entire faith." 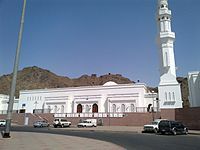 Throughout the Muslim world, religious institutions for people both young and old, from children's maddrassas to high-level scholarships received Saudi funding, "books, scholarships, fellowships, and mosques" (for example, "more than 1500 mosques were built and paid for with money obtained from public Saudi funds over the last 50 years"), along with training in the Kingdom for the preachers and teachers who went on to teach and work at these universities, schools, mosques, etc. The funding was also used to reward journalists and academics who followed the Saudis' strict interpretation of Islam; and satellite campuses were built around Egypt for Al Azhar, the world's oldest and most influential Islamic university. The interpretation of Islam promoted by this funding was the strict, conservative Saudi-based Wahhabism or Salafism. In its harshest form it preached that Muslims should not only "always oppose" infidels "in every way," but "hate them for their religion ... for Allah's sake," that democracy "is responsible for all the horrible wars of the 20th century," that Shia and other non-Wahhabi Muslims were infidels, etc. While this effort has by no means converted all, or even most Muslims to the Wahhabist interpretation of Islam, it has done much to overwhelm more moderate local interpretations, and has set the Saudi-interpretation of Islam as the "gold standard" of religion in minds of some or many Muslims. Qatar stands out among state sponsors of Islamism as well. Over the past two decades, the country has exerted a semi-formal patronage for the international movement of the Muslim Brotherhood. Former Qatari Sheikh Hamad bin Khalifa al-Thani in particular has distinguished himself as one of the most dedicated supporter of the Muslim Brotherhood and of Islamist movements in general both in the Middle Eastern region and across the globe. In 1999 the Muslim Brotherhood was disbanded in Qatar. The country's longstanding support for the group has been often explained as determined by a strategic calculus that limited the role played by religion in Qatar. As the director of the Center for International and Regional Studies at the Doha-based branch of Georgetown University, Mehran Kamrava, posited, Qatar presenting itself as the state patron of the Muslim Brotherhood has caused religion in Qatar to not "play any role in articulating or forming oppositional sentiments." Qatar's patronage has been primarily expressed through the ruling family's endorsement of Muslim Brotherhood's most representative figures, especially Yusuf al-Qaradawi. Qaradawi is a prominent, yet controversial Sunni preacher and theologian who continues to serve as the spiritual leader of the Muslim Brotherhood. An Egyptian citizen, Qaradawi fled Egypt for Qatar in 1961 after being imprisoned under President Gamal Abdul Nasser. In 1962 he chaired the Qatari Secondary Institute of Religious Studies, and in 1977 he founded and directed the Shariah and Islamic Studies department at the University of Qatar. He left Qatar to return to Egypt shortly before the 2011 Egyptian Revolution. For twenty years, Qaradawi has hosted a popular show titled Shariah and Life on the Qatari-based media channel Al-Jazeera, a government sponsored channel notoriously supportive of the Muslim Brotherhood and Islamism and often designated as a propaganda outlet for the Qatari government. From that platform, he has promoted his Islamist—and often radical views—on life, politics, and culture. His positions, as well as his controversial ties to extremist and terrorist individuals and organizations, made him persona non grata to the U.S., UK and French governments respectively in 1999, 2008, and 2012. Beyond the visibility and political protection granted to Yussuf al-Qaradawi, Qatar has historically hosted several Muslim Brothers especially after Egyptian President Mohammed Morsi, a Muslim Brotherhood representative, was overthrown in July 2013. Before 2013, however, Qatar had made a substantial investment on Morsi's leadership and had devolved about $10 million to Egypt since Morsi was elected, allegedly also to "buy political advantage" in the country. Qatar's political and financial support for Islamist movements and factions was not limited to the Egyptian case. Qatar is known to have backed Islamist factions in Libya, Syria and Yemen. In Libya in particular, Qatar has supported the Islamist government established in Tripoli. During the 2011 revolution that ousted President Muammar Gaddafi, Qatar provided "tens of millions of dollars in aid, military training and more than 20,000 tons of weapons" to anti-Gaddafi rebels and Islamist militias in particular. The flow of weapons was not suspended after Gaddafi's government was removed. Qatar maintained its influence through key facilitators on the field, including cleric Ali al-Sallabi, the leader of the Islamist militia "February 17 Katiba" Ismail al-Sallabi, and the Tripoli Military Council leader Abdel Hakim Belhaj. Hamas, as well, has been among the primary beneficiaries of Qatar's financial support. Not only does the Gulf emirate host Hamas' politburo continuously since 2012; Hamas leader Khaled Meshaal has often met with international delegations on Qatari territory. More recently, Qatar has channeled material support to Hamas' terrorist operations by exploiting its official commitment to finance Gaza reconstruction. Mostly through "truckloads of construction material being shipped into Gaza", Qatar has funneled dual-use substances that could be employed to produce explosives into Gaza. In a 2003 interview with Al-Hayat Hamas politburo declared that most of Qatar's support was collected through charities and popular committees. Qatar's largest NGO, Qatar Charity, in particular has played a great role in Qatar's mission to support Islamist worldwide. Officially through its "Ghaith" initiative but also through conspicuous donations that preceded the "Ghaith" program, Qatar Charity has financed the building or reconstruction of mosques and cultural institutes across the globe. Just like Saudi Arabia, Qatar has devolved considerable energies to spreading Salafism and to "win areas of influence" in the countries that beneficiated from its support. In France in particular Qatar has heavily invested in the Union des Organisations Islamiques des France (UOIF), an umbrella organization informally acting as the representative of the Muslim Brotherhood in the country through which Qatar Charity has channeled funds for the Assalam mosque in Nantes (€4.4 million) and the mosque in Mulhouse (€2 million). 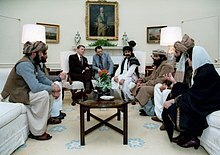 Afghan mujahideen representatives with President Ronald Reagan at the White House in 1983. During the 1970s and sometimes later, Western and pro-Western governments often supported sometimes fledgling Islamists and Islamist groups that later came to be seen as dangerous enemies. Islamists were considered by Western governments bulwarks against—what were thought to be at the time—more dangerous leftist/communist/nationalist insurgents/opposition, which Islamists were correctly seen as opposing. The US spent billions of dollars to aid the mujahideen Muslim Afghanistan enemies of the Soviet Union, and non-Afghan veterans of the war returned home with their prestige, "experience, ideology, and weapons", and had considerable impact. Although it is a strong opponent of Israel's existence, Hamas, officially created in 1987, traces back its origins to institutions and clerics supported by Israel in the 1970s and 1980s. Israel tolerated and supported Islamist movements in Gaza, with figures like Ahmed Yassin, as Israel perceived them preferable to the secular and then more powerful al-Fatah with the PLO. Egyptian President Anwar Sadat – whose policies included opening Egypt to Western investment (infitah); transferring Egypt's allegiance from the Soviet Union to the United States; and making peace with Israel—released Islamists from prison and welcomed home exiles in tacit exchange for political support in his struggle against leftists. His "encouraging of the emergence of the Islamist movement" was said to have been "imitated by many other Muslim leaders in the years that followed." This "gentlemen's agreement" between Sadat and Islamists broke down in 1975 but not before Islamists came to completely dominate university student unions. Sadat was later assassinated and a formidable insurgency was formed in Egypt in the 1990s. The French government has also been reported to have promoted Islamist preachers "in the hope of channeling Muslim energies into zones of piety and charity." Muslim alienation from Western ways, including its political ways. The proximity of the core of the Muslim world to Europe and Christendom where it first conquered and then was conquered. Iberia in the seventh century, the Crusades which began in the eleventh century, then for centuries the Ottoman Empire, were all fields of war between Europe and Islam. For almost a thousand years, from the first Moorish landing in Spain to the second Turkish siege of Vienna, Europe was under constant threat from Islam. In the early centuries it was a double threat—not only of invasion and conquest, but also of conversion and assimilation. All but the easternmost provinces of the Islamic realm had been taken from Christian rulers, and the vast majority of the first Muslims west of Iran and Arabia were converts from Christianity ... Their loss was sorely felt and it heightened the fear that a similar fate was in store for Europe. are the perpetual teachers; we, the perpetual students. Generation after generation, this asymmetry has generated an inferiority complex, forever exacerbated by the fact that their innovations progress at a faster pace than we can absorb them. ... The best tool to reverse the inferiority complex to a superiority complex ... Islam would give the whole culture a sense of dignity. For Islamists, the primary threat of the West is cultural rather than political or economic. Cultural dependency robs one of faith and identity and thus destroys Islam and the Islamic community (ummah) far more effectively than political rule. The end of the Cold War and Soviet occupation of Afghanistan has eliminated the common atheist Communist enemy uniting some religious Muslims and the capitalist west. Islamism, or elements of Islamism, have been criticized for: repression of free expression and individual rights, rigidity, hypocrisy, lack of true understanding of Islam, misinterpreting the Quran and Sunnah, antisemitism, and for innovations to Islam (bid'ah), notwithstanding proclaimed opposition to any such innovation by Islamists. The U.S. government has engaged in efforts to counter militant Islamism (Jihadism), since 2001. These efforts were centred in the U.S. around public diplomacy programmes conducted by the State Department. There have been calls to create an independent agency in the U.S. with a specific mission of undermining Jihadism. Christian Whiton, an official in the George W. Bush administration, called for a new agency focused on the nonviolent practice of "political warfare" aimed at undermining the ideology. U.S. Defense Secretary Robert Gates called for establishing something similar to the defunct U.S. Information Agency, which was charged with undermining the communist ideology during the Cold War. For a more comprehensive list, see List of Islamic political parties and Islamic extremism § Active Islamic extremist groups. ^ As such, Salafi Jihadism envisions the Islamist goals akin to that of Salafism instead of the traditional Islamism exemplified by the mid-20th century Muslim Brotherhood, which is considered by Salafi Jihadis as excessively moderate and lacking in literal interpretations of the scriptures. ^ a b Emin Poljarevic (2015). "Islamism". In Emad El-Din Shahin (ed.). The Oxford Encyclopedia of Islam and Politics. Oxford University Press. Retrieved 1 February 2017. Islamism is one of many sociopolitical concepts continuously contested in scholarly literature. It is a neologism debated in both Muslim and non-Muslim public and academic contexts. The term “Islamism” at the very least represents a form of social and political activism, grounded in an idea that public and political life should be guided by a set of Islamic principles. In other words, Islamists are those who believe that Islam has an important role to play in organizing a Muslim-majority society and who seek to implement this belief. ^ John L. Esposito, ed. (2014). "Islamist". The Oxford Dictionary of Islam. Oxford: Oxford University Press. Term used to describe an Islamic political or social activist. Coined in preference to the more common term “Islamic fundamentalist.” Islamists (al-Islamiyyun) are committed to implementation of their ideological vision of Islam in the state and/or society. ^ Soage, Ana Belén. "Introduction to Political Islam." Religion Compass 3.5 (2009): 887–96. ^ a b "Understanding Islamism" (PDF). International Crisis Group. p. 5. Archived from the original (PDF) on March 7, 2013. ^ Rashid Ghannouchi (31 October 2013). "How credible is the claim of the failure of political Islam?". MEMO. Archived from the original on 4 March 2016. ^ a b c d e f g Coming to Terms, Fundamentalists or Islamists? Martin Kramer originally in Middle East Quarterly (Spring 2003), pp. 65–77. ^ a b Hamid, Shadi (October 1, 2015). What most people get wrong about political Islam. Brookings. Retrieved December 2, 2017. ^ a b c Wright, Robin (10 January 2015). "A Short History of Islamism". Newsweek. Retrieved 23 December 2015. ^ a b Roy, Olivier (April 16, 2012). "The New Islamists". foreignpolicy.com. ^ "Islamism, n." Oxford English Dictionary. Oxford University Press. Retrieved 27 December 2012. ^ a b c "You are here: Home Press Center Press Releases CAIR Condemns Series of Terror Attacks in France, Tunisia and Kuwait CAIR Welcomes AP Stylebook Revision of 'Islamist'". Council on American-Islamic Relations (CAIR). 5 April 2013. Archived from the original on 2015-09-07. Retrieved 29 June 2015. ^ Briggs, David (June 29, 2012). Is It Time to Reconsider the Term Islamist?. Huffington Post. Retrieved December 2, 2017. ^ "AP Stylebook revises 'Islamist' use". Politico.Com. Retrieved 2014-08-18. ^ Bassam Tibi (2012). Islamism and Islam. Yale University Press. p. 22. ISBN 978-0300160147. ^ Nawaz, Maajid. "I was radicalised. So I understand how extremists exploit grievances". ^ Maajid Nawaz and Sam Harris. Islam and the Future of Tolerance: A Dialogue. Harvard University Press. Cambridge, Massachusetts. London. (2015). Kindle Edition, Location 167 of 1580. ^ "Fred Halliday, from "The Left and the Jihad", Open Democracy 7 September 2006". Opendemocracy.net. 2011-04-06. Retrieved 2012-04-21. ^ Speech by Robert H. Pelletreau, Jr. Archived 2017-10-10 at the Wayback Machine, Council on Foreign Relations, May 8, 1996. ^ Roy, Olivier; Sfeir, Antoine (2007). The Columbia World Dictionary of Islamism. Columbia University Press. p. viii. ISBN 978-0231146401. Retrieved 15 December 2015. ^ a b Roy, Olivier (1994). The Failure of Political Islam. p. 24. ^ Roy, Olivier (1994). The Failure of Political Islam. p. 109. ^ Hayri Abaza (October 22, 2010). "Is It Islamic or Islamist?". Newsweek. ^ Abid Ullah Jan (February 27, 2006). "Wikipedia: Good Intentions, Horrible Consequences By Abid Uallah Jan". Al-Jazeerah. Archived from the original on July 16, 2012. Retrieved November 16, 2015. ^ "Understanding Islamism". International Crisis Group. 2 March 2005. Archived from the original (PDF) on August 8, 2010. ^ Daniel Pipes (March 1, 2000). "Islam and Islamism: Faith and Ideology". The National Interest (Spring 2000). Retrieved March 12, 2014. ^ Cevik, Neslihan. Muslimism in Turkey and Beyond: Religion in the Modern World. Springer, Nov 17, 2015. p. 16. ^ a b c The Key to Arab Reform: Moderate Islamists. Carnegie Endowment for Peace. p. 2. Retrieved December 2, 2017. ^ a b Moussalli, Ahmad S. Islamic democracy and pluralism. from Safi, Omid. Progressive Muslims: On Justice, Gender, and Pluralism. Oneworld Publications, Apr 1, 2003. ^ "The Shura Principle in Islam - by Sadek Sulaiman". www.alhewar.com. ^ "Ennahda is "Leaving" Political Islam". Wilson Center. 2016-05-20. Retrieved 2017-08-23. ^ Al-Hamdi, Ridho. (2017). Moving towards a Normalised Path: Political Islam in Contemporary Indonesia. JURNAL STUDI PEMERINTAHAN (JOURNAL OF GOVERNMENT & POLITICS). Vol. 8 No. 1, February 2017. p. 53, 56-57, 62. ^ Pahwa, Sumita (2016). Pathways of Islamist adaptation: the Egyptian Muslim Brothers' lessons for inclusion moderation theory. Democratization, Volume 24, 2017 - Issue 6. pp. 1066-1084. ^ de Bellaigue, Christopher (December 19, 2013). "Turkey: 'Surreal, Menacing…Pompous'". New York Review of Books. Retrieved 12 December 2013. ^ Akyol, Mustafa (July 22, 2016). "Who Was Behind the Coup Attempt in Turkey?". New York Times. Retrieved 23 July 2016. ^ Al-Tamimi, Aymenn Jawad (November 16, 2011). What Does 'Moderate Islamist' Mean?. Jerusalem Post. Retrieved December 3, 2017. ^ Badamchi, Meysam (2017). Post-Islamist Political Theory: Iranian Intellectuals and Political Liberalism in Dialogue. Philosophy and Politics - Critical Explorations. 5. Springer. ISBN 978-3319594927. ^ Bayat, Asef (Fall 1996). "The Coming of a Post-Islamist Society". Critique: Critical Middle Eastern Studies. 5 (9): 43–52. doi:10.1080/10669929608720091. ^ Bubalo, Anthony; Fealy, Greg; Mason, Whit (2008). Zealous Democrats: Islamism and Democracy in Egypt, Indonesia and Turkey (PDF). Australia: Lowy Institute for International Policy. ISBN 978-1921004353. Archived from the original (PDF) on 2017-03-05. Retrieved 2017-12-04. ^ Cavatorta, Francesco; Merone, Fabio (2015). "Post-Islamism, ideological evolution and 'la tunisianite of the Tunisian Islamist party al-Nahda". Journal of Political Ideologies. 20 (1): 27–42. doi:10.1080/13569317.2015.991508. ^ a b c d Mohie-Eldin, Fatima. The Evolution of Salafism A History of Salafi Doctrine. Al-Noor, Fall 2015. pp. 44-47. ^ Richard Gauvain, Salafi Ritual Purity: In the Presence of God, p. 41. New York: Routledge, 2013. ^ The Transmission and Dynamics of the Textual Sources of Islam: Essays in Honour of Harald Motzki, eds. Nicolet Boekhoff-van der Voort, Kees Versteegh and Joas Wagemakers, p. 382. Leiden: Brill Publishers, 2011. ^ Kasra Shahhosseini, The Rise of ISIS: Who's to Blame? International Policy Digest, October 20, 2014. ^ George Joffé, Islamist Radicalisation in Europe and the Middle East: Reassessing the Causes of Terrorism, p. 317. London: I.B. Tauris, 2013. ^ Cite error: The named reference Dillon-3-4 was invoked but never defined (see the help page). ^ Stephane Lacroix, Al-Albani's Revolutionary Approach to Hadith. Leiden University's ISIM Review, Spring 2008, #21. ^ a b (Salafism has been termed a hybridation between the teachings of Ibn Abdul-Wahhab and others which have taken place since the 1960s) Stephane Lacroix, Al-Albani's Revolutionary Approach to Hadith. Leiden University's ISIM Review, Spring 2008, #21. ^ Murphy, Caryle (September 5, 2006). "For Conservative Muslims, Goal of Isolation a Challenge". Washington Post. ^ Lewis, Bernard (April 27, 2006). "Islam and the West: A Conversation with Bernard Lewis (transcript)". pewforum.org. Pew. Retrieved 5 August 2014. ^ "Saudi Arabia. Wahhabi Theology". December 1992. Library of Congress Country Studies. Retrieved 17 March 2014. ^ a b Husain, Ed (2007). The Islamist: Why I joined Radical Islam in Britain, what I saw inside and why I left. Penguin Books. p. 246. ^ "Wahhabism: Understanding the Roots and Role Models of Islamic Fanaticism and Terror". AGAINST "ISLAMIC" TERRORISM & ISLAMOPHOBIA. 2014-02-18. ^ Lacey, Robert (2009). Inside the Kingdom: Kings, Clerics, Modernists, Terrorists, and the Struggle for Saudi Arabia. Viking. p. 56. ^ Kepel, Gilles (2002). Jihad: The Trail of Political Islam. I.B.Tauris. p. 61. ISBN 978-1845112578. ^ a b "Analysis Wahhabism". PBS Frontline. Retrieved 13 May 2014. ^ William McCants of the US Military Academy's Combating Terrorism Center, quoted in Qutbism: An Ideology of Islamic-Fascism Archived 2017-02-11 at the Wayback Machine by Dale C. Eikmeier. From Parameters, Spring 2007, pp. 85–98. ^ a b Eikmeier, DC (Spring 2007). Qutbism: An Ideology of Islamic-Fascism. 37. Parameters, US Army War College Quarterly. p. 89. In addition to offensive jihad Sayyid Qutb used the Islamic concept of “takfir” or excommunication of apostates. Declaring someone takfir provided a legal loophole around the prohibition of killing another Muslim and in fact made it a religious obligation to execute the apostate. The obvious use of this concept was to declare secular rulers, officials or organizations, or any Muslims that opposed the Islamist agenda a takfir thereby justifying assassinations and attacks against them. Sheikh Omar Abdel Rahman, who was later convicted in the 1993 World Trade Center attack, invoked Qutb's takfirist writings during his trial for the assassination of President Anwar Sadat. The takfir concept along with “offensive jihad” became a blank check for any Islamic extremist to justify attacks against anyone. ^ a b c Hassan, Hassan. (June 13, 2016). The Sectarianism of the Islamic State: Ideological Roots and Political Context. Carnegie Endowment for Peace. Retrieved December 3, 2017. ^ "How Did Sayyid Qutb Influence Osama bin Laden?". Retrieved 26 February 2015. ^ Deneoux, Guilain (June 2002). "The Forgotten Swamp: Navigating Political Islam". Middle East Policy. pp. 69–71." ^ Kramer, Martin (Spring 2003). "Coming to Terms: Fundamentalists or Islamists?". Middle East Quarterly. X (2): 65–77. French academics have put the term into academic circulation as 'jihadist-Salafism.' The qualifier of Salafism—an historical reference to the precursor of these movements—will inevitably be stripped away in popular usage. ^ القطبية الإخوانية والسرورية قاعدة مناهج السلفية التكفيرية. al-Arab Online. Retrieved December 4, 2017. ^ Kepel, Gilles; Roberts, Anthony F. (2006). Jihad. ISBN 978-1845112578. Retrieved 24 October 2014. ^ "Salafism: Politics and the puritanical". The Economist. 27 June 2015. Retrieved 29 June 2015. ^ a b Wright, Robin (December 12, 2016). "AFTER THE ISLAMIC STATE". The New Yorker. Retrieved 9 December 2016. ^ a b Noah, Timothy (February 26, 2009). The Near-Enemy Theory. Slate. Retrieved December 3, 2017. ^ Al Qaeda grows as its leaders focus on the 'near enemy'. The National. Retrieved December 3, 2017. ^ a b c d e Byman, Daniel L and Williams, Jennifer R. (February 24, 2015). ISIS vs. Al Qaeda: Jihadism's global civil war. Brookings. Retrieved December 3, 2017. ^ Qamar-ul Huda (2003), Striving for Divine Union: Spiritual Exercises for Suhraward Sufis, RoutledgeCurzon, pp. 1–4. ^ Haque 1982, pp. 78–81. ^ Mortimer, Faith and Power, (1982) pp. 67–68. ^ a b c "Allama Muhammad Iqbal Philosopher, Poet, and Political leader". Aml.Org.pk. Archived from the original on 2012-03-05. Retrieved 2012-03-02. ^ Anil Bhatti. "Iqbal and Goethe" (PDF). Yearbook of the Goethe Society of India. Archived from the original (PDF) on October 30, 2008. Retrieved 2011-01-07. ^ Rahnemaa, Saeed (2008). "Radical Islamism and Failed Developmentalism". Third World Quarterly. 29 (3): 483–96. doi:10.1080/01436590801931462. ^ "Leading News Resource of Pakistan". Daily Times. 28 May 2003. Archived from the original on 2005-05-06. Retrieved 2011-01-07. ^ a b c "Iqbal Academy Pakistan". Retrieved 25 October 2014. ^ a b "Allama Iqbal – biography – Iqbal's works" (PHP). Iqbal Academy. 26 May 2006. Retrieved 6 August 2012. ^ "Maulana Maududi's Two-Nation Theory". Witness-pioneer.org. 2012-01-27. Retrieved 2012-04-21. ^ Bonney, R (2004). Jihad: From Qur'an to Bin Laden. Hampshire: Palgrave Macmillan. p. 201. Mawdudi trained with two Deobandi ulama at the Fatihpuri mosque's seminary in Delhi and received his certificates to teach religious sciences (ijazahs) in 1926. ^ "A. Maududi's 'Towards Understanding Islam'". 2009-10-26. Archived from the original on 2009-10-26. Retrieved 2012-04-21. ^ Abu al-A'la al-Mawdudi, "Political Theory of Islam," in Khurshid Ahmad, ed., Islam: Its Meaning and Message (London: Islamic Council of Europe, 1976), pp. 159–61. ^ Esposito, The Islamic Threat, pp. 125–26; Voll and Esposito, Islam and Democracy, pp. 23–26. ^ He was the author of the book S. Abul A'la Maududi, The Process of Islamic Revolution Archived September 8, 2015, at the Wayback Machine (Lahore, 1980). ^ Nasr, Seyyed Vali Reza (1996). Mawdudi and the Making of Islamic Revivalism. Oxford, New York: Oxford University Press. p. 77. ISBN 978-0195357110. ^ * Mura, Andrea (2012). "A genealogical inquiry into early Islamism: the discourse of Hasan al-Banna". Journal of Political Ideologies. 17 (1): 61–85. doi:10.1080/13569317.2012.644986. ^ "Egypt, A Timeline of Recent Events". Gemsofislamism.tripod.com. Retrieved 2012-04-21. ^ "Free Republic. The day before, and after – It's been 25 years since the Islamist genie first went on the rampage". Fr.jpost.com. Archived from the original on 2011-12-23. Retrieved 2012-04-21. ^ The Islamism Debate: God's Counterculture Sonja Zekri, Süddeutsche Zeitung / Qantara.de 2008. Translated from the German by Phyllis Anderson. ^ Islamists Win 70% of Seats in the Egyptian Parliament The New York Times. ^ * Mura, Andrea (2014). "The Inclusive Dynamics of Islamic Universalism: From the Vantage Point of Sayyid Qutb's Critical Philosophy". Comparative Philosophy. 5 (1): 29–54. ^ "How Did Sayyid Qutb Influence Osama bin Laden?". Gemsofislamism.tripod.com. Retrieved 2012-04-21. ^ "Ahmadinejad: Wipe Israel off map October 28, 2005". 2007-03-12. Archived from the original on 2007-03-12. Retrieved 2012-04-21. ^ "Masjid-ul-Haram: Sacred and forbidden". Ourdialogue.com. Archived from the original on 20 April 2012. Retrieved 2012-04-21. ^ Atkins, Stephen E. (2004). Encyclopedia of Modern Worldwide Extremists and Extremist Groups. Greenwood Publishing Group. p. 35. ISBN 978-0-313-32485-7. Retrieved 5 October 2014. ^ a b Commins, David (2006). The Wahhabi Mission and Saudi Arabia. London: I.B.Tauris & Co Ltd. p. 174. In all, perhaps 35,000 Muslim fighters went to Afghanistan between 1982 and 1992, while untold thousands more attended frontier schools teeming with former and future fighters. ^ Rashid, Ahmed, Taliban: Militant Islam, Oil and Fundamentalism in Central Asia (New Haven, 2000), p. 129. ^ "How the CIA created Osama bin Laden". Green Left Weekly. 2001-09-19. Retrieved 2007-01-09. ^ "bin Laden interview with Peter Arnett, March 1997". Anusha.com. Retrieved 2012-06-08. ^ "BBC article stating that bin Laden is "a man without sin"". BBC News. 1998-11-21. Retrieved 2012-06-08. ^ "Five men to die by hanging for Bangladesh 1971 war crimes". Punch Newspapers. August 13, 2018. Retrieved 30 December 2018. ^ "Mannen en vrouwen apart op de bus: opmerkelijk voorstel van Islam-partij stuit op felle kritiek". hln.be (in Dutch). Retrieved 2018-04-07. ^ "Partij Islam wil islamitische staat in België en vrouwen en mannen apart op de bus". hln.be (in Dutch). Retrieved 2018-04-07. ^ "Timeline of modern Egypt". Gemsofislamism.tripod.com. Retrieved 2012-06-08. ^ "Egypt frees 900 Islamist militants". English.aljazeera.net. Retrieved 2012-04-21. ^ "Hamas imposes Sharia law in Gaza". VOLTAIRE NETWORK. 1 April 2014. Retrieved 29 October 2015. "Hamas leader condemns Islamist charity blacklist". Reuters. 2007-08-23. Retrieved 2009-01-28. Hider, James (2007-10-12). "Islamist leader hints at Hamas pull-out from Gaza". London: The Times Online. Retrieved 2009-01-28. The New Hamas: Between Resistance and Participation. Middle East Report. Graham Usher, August 21, 2005 "Council on Foreign Relations". Council on Foreign Relations. Retrieved May 27, 2010. ^ "Frequently Asked Questions About Hamas". Abcnews.go.com. 2006-01-06. Retrieved 2011-08-02. ^ a b c d Long, Baudouin (Winter 2010). "The Hamas Agenda: How Has It Changed?". Middle East Policy Council. XVII (4). Retrieved 29 June 2015. ^ Greene, Toby (August 28, 2014). "Gaza Conflict Has Hurt Hamas – Now We Must Build on Their Failure". International Business Times. Retrieved 29 June 2015. ^ Asian Survey, 6, n. 29, William L. Richter, "The Political Dynamics of Islamic Resurgence in Pakistan." ^ "Human Rights Watch 1989 Sudan". Hrw.org. Retrieved 2012-06-08. ^ "AKP explains charter changes, slams foreign descriptions". Hürriyet Daily News. Istanbul. 2010-03-28. Retrieved 2013-10-02. [...] the AKP's Hüseyin Çelik [...] took the opportunity to be critical of the foreign press on their descriptions of the party. ... 'In the Western press, when the AK Party administration, the ruling party of the Turkish Republic, is being named, unfortunately most of the time "Islamic," "Islamist," "mildly Islamist," "Islamic-oriented," "Islamic-leaning," "Islamic-based" or "with an Islamic agenda," and similar language is being used. These characterizations do not reflect the truth, and they sadden us,' Çelik said. ^ Rumi, Raza. "The Prospects for Reform in Islam". Retrieved 2017-01-24. ^ Evans, Kevin R (2003). The history of political parties & general elections in Indonesia. Jakarta:Arise Consultancies. ^ Schwarz, Adam (1994). A Nation in Waiting: Indonesia in the 1990s. Allen & Unwin. p. 172. ISBN 978-0521773263. ^ Dhume, Sadanand (1 December 2005). "Indonesian Democracy's Enemy Within". Yale Global. Archived from the original on 19 December 2005. ^ "Jordan's Islamic Front rallies Muslims". Retrieved 25 October 2014. ^ A. Nizar Hamzeh "Islamism in Lebanon: A Guide to the Groups", Middle East Quarterly, 1997, 4, 47–53. ^ "Muslim Brotherhood formally launches party". Libya Herald. 3 March 2012. Retrieved 8 March 2012. ^ Soguel, Dominique (3 March 2012). "Muslim Brother picked to lead new Libya party". Times of India. Tripoli. Agence France-Presse. Archived from the original on 1 July 2012. Retrieved 8 March 2012. ^ Chen, Cherice (25 November 2011). "Morocco votes in first election since protests; Islamist party eyes victory". Taiwan News. Retrieved 25 November 2011. ^ Alami, Aida (25 November 2011). "Moroccans Vote in Election Marking Shift of Power From King". Bloomberg Businessweek. Archived from the original on 27 November 2011. Retrieved 25 November 2011. ^ Oweis, Khaled Yacoub (6 May 2012). "Syria's Muslim Brotherhood rise from the ashes". Reuters. ^ "Mountain Rigger". The Economist. November 11, 2006. ^ Kaminski, Matthew (26 October 2011). "On the Campaign Trail With Islamist Democrats". The Wall Street Journal. Retrieved 26 October 2011. ^ Feldman, Noah (2011-10-30). "Islamists' Victory in Tunisia a Win for Democracy: Noah Feldman". Bloomberg. Retrieved 2011-10-31. ^ Bay, Austin. "Tunisia and its Islamists: The Revolution, Phase Two". Retrieved 2012-03-22. ^ Totten, Michael. "No to America and No to Radical Islam". Archived from the original on 2012-03-24. Retrieved 2012-03-22. ^ Emmanuel Kisiangani. "Islamist insurgents in eastern Africa". D+C, development and cooperation. Retrieved 21 December 2015. ^ "AL-QA'IDA IN THE LANDS OF THE ISLAMIC MAGHREB (AQIM)". National Counter-terrorist Center. Retrieved 2 July 2015. ^ Hizb ut-Tahrir (February 2011). The Draft Constitution of the Khilafah State (PDF). Khilafah. Retrieved 29 March 2017. ^ "Draft Constitution by Hizb ut-Tahrir". Media Office of Hizb ut-Tahrir. Archived from the original on 27 September 2007. Retrieved 29 March 2017. ^ a b Shiv, Malik (13 September 2004). "For Allah and the caliphate". New Statesman. ^ a b c d e Mecham, Quinn (October 24, 2014). "The evolution of Islamism since the Arab uprisings". Washington Post. Retrieved 28 October 2015. ^ "Rethinking Political Islam". brookings.edu. Brookings. Retrieved 29 October 2015. ^ Osman, Tarek (2016). Islamism: What It Means for the Middle East and the World. Yale University Press. p. 244. ISBN 978-0300197723. Retrieved 18 October 2016. ^ "Kurds accused of 'ethnic cleansing' by Syria rebels". CBS News. 15 June 2015. Retrieved 22 June 2015. ^ "ISIS announces formation of Caliphate, rebrands as 'Islamic State'". ^ "Islamic State-controlled parts of Syria, Iraq largely out of reach: Red Cross". Reuters. 13 March 2015. Retrieved 25 June 2015. ^ "Exclusive: In turf war with Afghan Taliban, Islamic State loyalists gain ground". Reuters. 29 June 2015. Retrieved 6 October 2015. ^ "Militant Attack and Support Zones in Afghanistan" (PDF). Institute for the Study of War. 18 September 2015. Archived from the original (PDF) on 23 September 2015. Retrieved 22 September 2015. ^ "Statehood (international law)". Wex. Cornell University. Retrieved 20 July 2015. ^ "Pakistan Taliban splinter group vows allegiance to Islamic State". Reuters. 18 November 2014. Retrieved 19 November 2014. ^ Zavadski, Katie (23 November 2014). "ISIS Now Has a Network of Military Affiliates in 11 Countries Around the World". New York. Retrieved 25 November 2014. ^ Holmes, Oliver (3 February 2014). "Al Qaeda breaks link with Syrian militant group ISIL". Reuters. Retrieved 6 July 2014. ^ Sly, Liz (3 February 2014). "Al-Qaeda disavows any ties with radical Islamist ISIS group in Syria, Iraq". The Washington Post. Retrieved 7 February 2014. ^ Khalid al-Taie (13 February 2015). "Iraq churches, mosques under ISIL attack". Al-Shorfa. Archived from the original on 19 February 2015. Retrieved 27 February 2015. ^ Thought, Enlightened (2008-04-23). "What went wrong in the Muslim World?". Muslimdecline.blogspot.com. Archived from the original on 13 February 2012. Retrieved 2012-04-21. ^ "An interview with Minister Mentor of Singapore, Lee Kuan Yew". Accessmylibrary.com. 2004-09-24. Archived from the original on July 13, 2009. Retrieved 2012-04-21. ^ a b Pike, John. "Muslim Brotherhood in Qatar". www.globalsecurity.org. Retrieved 2016-06-09. ^ a b Bryant, Christa Case (2014-04-18). "Behind Qatar's bet on the Muslim Brotherhood". Christian Science Monitor. ISSN 0882-7729. Retrieved 2016-06-09. ^ Kessler, Oren (2012-01-01). "The Two Faces of Al Jazeera". Middle East Quarterly. ^ "Why Egypt Hates Al Jazeera". Foreign Policy. Retrieved 2016-06-09. ^ Kirkpatrick, David D. (2014-09-07). "Qatar's Support of Islamists Alienates Allies Near and Far". The New York Times. ISSN 0362-4331. Retrieved 2016-06-09. ^ "Muslim cleric not allowed into UK". BBC. 2008-02-07. Retrieved 2016-06-09. ^ "France election: Sarkozy vows ban on militant preachers". BBC News. Retrieved 2016-06-09. ^ "Egypt crisis: Fall of Morsi challenges Qatar's new emir". BBC News. Retrieved 2016-06-09. ^ Kerr, Simeon (2013-07-03). "Fall of Egypt's Mohamed Morsi is blow to Qatari leadership". Financial Times. ISSN 0307-1766. Retrieved 2016-06-09. ^ "The UAE and Qatar Wage a Proxy War in Libya". International Policy Digest. 2015-12-13. Retrieved 2016-06-09. ^ a b Dagher, Sam; Tripoli, Charles Levinson in; Doha, Margaret Coker in (2011-10-17). "Tiny Kingdom's Huge Role in Libya Draws Concern". Wall Street Journal. ISSN 0099-9660. Retrieved 2016-06-09. ^ a b c Spencer, By David Blair and Richard. "How Qatar is funding the rise of Islamist extremists". Telegraph. Retrieved 2016-06-09. ^ Boghardt, Lori Plotkin (2014-10-06). "Qatar Is a U.S. Ally. They Also Knowingly Abet Terrorism. What's Going On?". New Republic. Retrieved 2016-06-09. ^ Reports, CATF. "Is Gaza Reconstruction Aid Rearming Hamas?". Archived from the original on 2017-10-10. ^ "Attempt to smuggle ammonium chloride into Gaza foiled 3 May 2016". GxMSDev. Retrieved 2016-06-09. ^ "Israel lied about Isil soldiers entering Gaza to justify its siege, Hamas claims". The Telegraph. Retrieved 2016-06-09. ^ "Dar Al Hayat". 10 December 2005. Archived from the original on 10 December 2005. ^ "Qatar Charity Launches "Ghaith" (Rain) Initiative for Islamic Projects Worldwide". Qatar Charity. Retrieved 2016-06-09. ^ Finance, Consortium Against Terrorist. "Qatar: From Oxford Classrooms to Europe's Hearts and Minds". Archived from the original on 2017-10-10. ^ a b Finance, Consortium Against Terrorist. "No Petrodollar Land Grabbing for Qatar in Brussels". Archived from the original on 2016-03-24. Retrieved 2016-06-09. ^ a b Terror and Liberalism by Paul Berman, W.W. Norton and Company, 2003, p. 101. ^ Higgins, Andrew (24 January 2009). "How Israel Helped to Spawn Hamas". The Wall Street Journal. Archived from the original on 15 January 2013. Retrieved 15 January 2017. ^ "How Israel and the United States Helped to Bolster Hamas". Democracynow.org. 26 January 2006. ^ Kepel, Gilles. Jihad: the trail of political Islam. p. 83. ^ Kepel, Gilles, Muslim Extremism in Egypt, chapter 5, "Vanguard of the Umma"
^ "From the article on westernization in Oxford Islamic Studies Online". Oxfordislamicstudies.com. Retrieved 2012-04-21. ^ Wistrich, Robert S. "Anti-Semitism and Jewish destiny." Jpost.com. 20 May 2015. 26 May 2015. ^ "Information Warfare Matters". Online.wsj.com. 2008-12-01. Retrieved 2012-06-08. ^ "Creating a New Public Diplomacy Cabinet Post. Spring 2008". Brookings.edu. Archived from the original on 2013-05-25. Retrieved 2012-06-08. Roy, Olivier (1994). The Failure of Political Islam. Harvard University Press. ISBN 978-0674291416. Retrieved 2 April 2015. Ayubi, Nazih (1991). Political Islam. London: Routledge. Esposito, John (1998). Islam and Politics (Fourth ed.). Syracuse NY: Syracuse University Press. Halliday, Fred (2003). Islam and the Myth of Confrontation (2nd ed.). London, New York: I.B. Tauris. Hassan, Riaz (2008). Inside Muslim Minds. Melbourne University Press. Mandaville, Peter (2007). Transnational Muslim Politics. Abingdon (Oxon), New York: Routledge. Sayyid, S. (2003). A Fundamental Fear: Eurocentrism and Emergence of Islamism (2nd ed.). London, New York: Zed Press. Strindberg, Anders; Wärn, Mats (2011). Islamism. Cambridge, Malden MA: Polity Press. Tausch, Arno (2015). The political algebra of global value change. General models and implications for the Muslim world. With Almas Heshmati and Hichem Karoui (1st ed.). Nova Science Publishers, New York. ISBN 978-1629488998. Teti, Andrea; Mura, Andrea (2009). Jeff Haynes (ed.). Sunni Islam and politics. Routledge Handbook of Religion and Politics. Abingdon (Oxon), New York: Routledge. Volpi, Frédéric (2010). Political Islam Observed. Hurst. Kepel, Gilles (2002). Jihad: The Trail of Political Islam. Harvard University Press. ISBN 978-0674010901. Wikimedia Commons has media related to Islamism and Victims of Islamism. This page was last edited on 23 April 2019, at 23:46 (UTC).